A new study from scientists with the International Maize and Wheat Improvement Center (CIMMYT) and the CGIAR Research Program on Maize (MAIZE) in Kenya has revealed key information about the genetic basis of maize lethal necrosis (MLN), a disease that has been wreaking havoc on maize crops in eastern Africa since its discovery in the region in 2011. Maize is the main staple food crop in sub-Saharan Africa and is cultivated on more than 35 million hectares of rain-fed agricultural land, providing sustenance to millions. 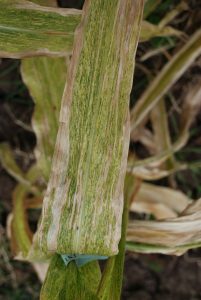 The MLN disease, caused by a combination of the maize chlorotic mottle virus (MCMV) and sugarcane mosaic virus (SCMV), causes irreversible damage that kills maize plants before they can grow and produce grain. Yield losses from infected fields in Kenya range from 30-100 percent, depending on the stage of disease infection and the prevailing environmental conditions. Such losses dramatically increase the risk of food insecurity in the region and weaken the ability of smallholder farmers to feed their families. The MLN viruses can be transmitted not only by insect vectors but also through contaminated seed. Application of pesticides to protect crops against disease vectors is an expensive and time-consuming pursuit for smallholders in eastern Africa and is not environmentally friendly over the long-term. The development of MLN-resistant maize varieties through conventional breeding is both an economically and environmentally sustainable management option that will ultimately protect the livelihoods of the region’s smallholder maize farmers. Understanding the genetic basis of MLN resistance can help maize breeders to design an appropriate strategy to develop MLN resistant lines. The study genotyped populations derived from many parents with varied level of MLN response using high density markers and used this information to map the genomic regions associated with MLN resistance. Both linkage and joint-linkage association mapping revealed that MLN is controlled by a few major genes specifically located in chromosome 3 and 6, as well as several minor genes present in different regions across the genome. The identified major genes can be used for marker assisted selection to improve elite lines quickly to develop more resistant varieties for farmers. As a first step towards marker assisted breeding, these major effect quantitative trait loci (QTL), or genomic regions associated with MLN resistance, are currently being included in marker assisted back-crossing projects initiated by CIMMYT in east Africa with the objective to convert elite maize inbred lines that are widely used in Africa into MLN-resistant versions. The study’s authors recommend that if the breeding objective is to improve the level of MLN resistance, prioritize the major effect QTL and introgress them into susceptible lines. If the breeding objective is to incorporate resistance from multiple source by including both major and minor genes in the selection, genomic prediction is better approach. The use of such modern breeding technologies will allow the region to continually adapt and improve its staple maize varieties in step with emerging disease vectors and ultimately safeguard food security. To read the original study, “Discovery and validation of genomic regions associated with resistance to maize lethal necrosis in four biparental populations”, please click here. This study was funded in part by the CGIAR Research Program on Maize.